The growing conditions have been close to perfect in every way this summer. A wet and cold March and April, thus the buds remained dormant, followed by a warm May, a hot June and July. Then good warm conditions in August and September with some rain. That meant we avoided the dangerous combination in April of warm days — and hence bud burst — followed by clear cold and frosty nights. We had consistent flowering over a short period, good fruit set and excellent veraison (when the bunches soften and change colour) with even-sized berries. Disease-wise we had no mildew and the dreaded fruit fly ( spotted winged drosophila) was held at bay by our success in killing many of the males which hibernated in adjacent hedges during the winter. The female then lays her eggs under the skin of the grape bunches and when they hatch they break the skin and cause botrytis (rot). The damage can be swift and widespread. We recorded 950 growing degree days from 1 April to 20 October this year compared to 845 last year. Statistics can be misleading as last year’s figure included a very warm April when we had early bud burst only to have them destroyed by frost. Growing degree days are calculated by subtracting a threshold temperature 10 °C from the average daily air temperature in °C. Average daily air temperature is calculated by averaging the daily maximum and minimum air temperatures measured in any 24-hour period. There was every expectation that this was going to be a gargantuan harvest and it proved to be just that. Our wine maker asked in July for our best guestimates of harvest tonnage given that the winery had to plan for buying in extra tanks. Not an easy task, but after random vine shoot counts and then an average bunch weight per vine we went for 4-5 tonnes. In the event we managed 7.5 tonnes! On 30 September (last year it was 17 October) we pick a ‘golden harvest’ of the pinot noir by taking off just the ripest bunches — those are were 100% dark purple rather bunches with either red or green berries. Our pickers do a magnificent job in selection and this was reflected in the average sugar levels of Brix 17.5 and acid levels of 12.5. 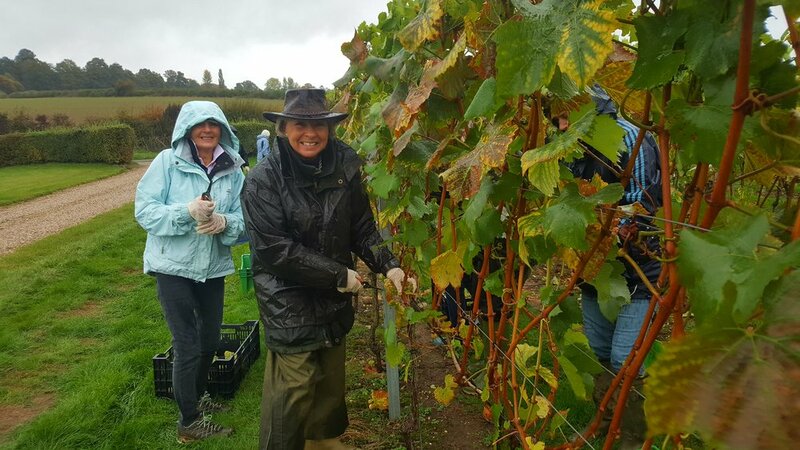 Our hardy pickers defy the wind and the rain to gather in our Chardonnay grapes. Quality standards. Robert sets out his stall with samples of grape bunches with disease that must not go in the crate. ‘A drop of sour milk can ruin a cup of tea’. The experienced ones have heard it before but the ‘new bugs’ listen attentively. Next came the chardonnay vendage on 6 October. This was always going to be challenging given the anticpated volume and, on the day, the weather conditions of driving rain. In the event we managed to persuade 30 of our hard friends and family to pitch up. By 12.30pm we were finished with 4.5 tonnes in crates on two large trailers and a transit van. The journey in convoy to the winery in Hampshire along the A34 at 45mph in driving wind and rain was nerve racking but our cargo arrived safely. Finally, on 9 October we made the decision, having looked at the weather forecast, to pick the second half of the pinot. In the intervening 10 days the remaining grapes haven ripened nicely and our small team work methodically down each row. There are still some partially unripen bunches which are left for the birds.